In a joy-filled Easter service at St James today Ose, Isabela, Ebony and Suriya were admitted to communion having participated in a preparation course run by Jacob. 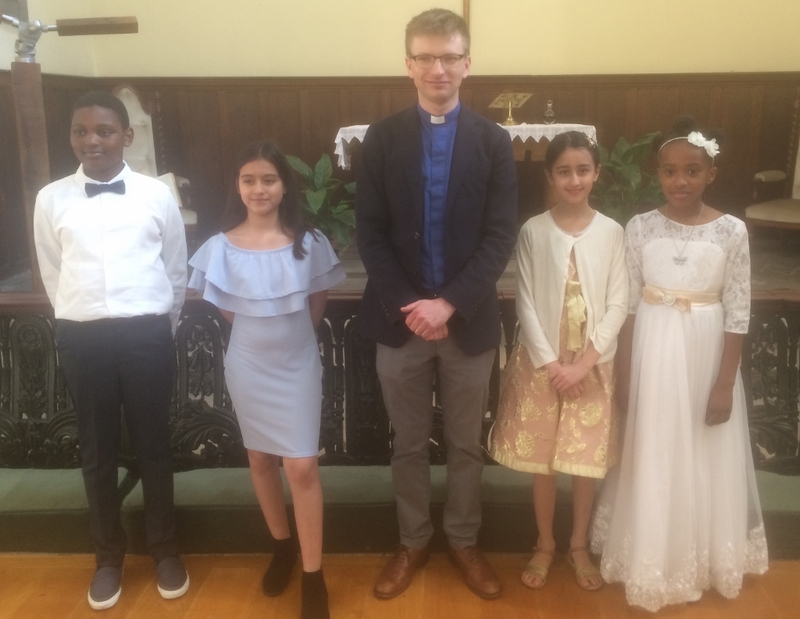 Two of the candidates hadn't been baptised so first they were baptised, along with four of their siblings, making this a really bumper service of celebration. In the sermon we heard how on the first Easter Day when it first became clear that the tomb was empty there was running, crying, and confusion. I said they believed but they didn't understand. They believed the tomb was empty but they didn't understand the Scripture that said that Jesus must rise from death (John 20.9). When Jesus appeared to Mary she at first didn't recognise him. The moment of revelation came when he called her name. Then what did she do? She hugged him. That was what he said, rather than 'do not touch me', because he was back from the dead, with a real live, solid, physical, huggable body. And Mary did what anyone would do if they encountered a loved one back from the dead. She hugged him. 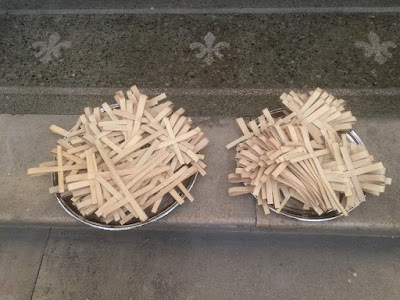 Poignantly, overnight we had heard the news of terrible scenes in Sri Lanka in which over 200 have been killed so we stopped to pray in silence before the end of the service for our brothers and sisters in that country. And then before we concluded with a triumpant rendition of 'Thine be the glory risen conquering Son' our customary birthday slot in the notices was extended with three cheers for the Queen on her 93rd birthday, rounding off a great celebration of joy, tinged with much sadness for Sri Lanka and the suffering church throughout the world. 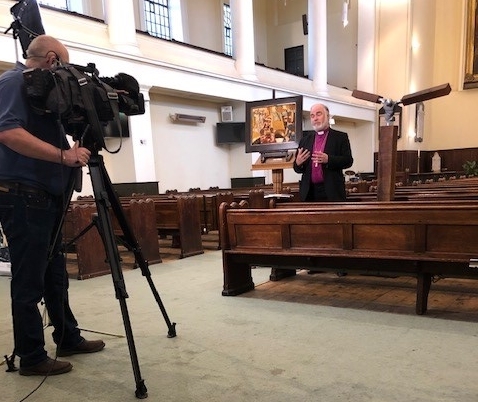 SKY News was broadcasting live from St James this Easter Sunday, featuring Bishop Graham Kings speaking on the meaning of Easter. First broadcast at 7.10am, it is due to be repeated at 8.10am and 9.10am. In brilliant sunshine we walked from St Anne's this Good Friday morning, meeting our brothers and sisters from St Mary's on the way, for our annual Open Air Service at the Blue at the heart of Bermondsey. We had previously enjoyed a great family service for St James and St Anne's at St Anne's, with Paul preaching. 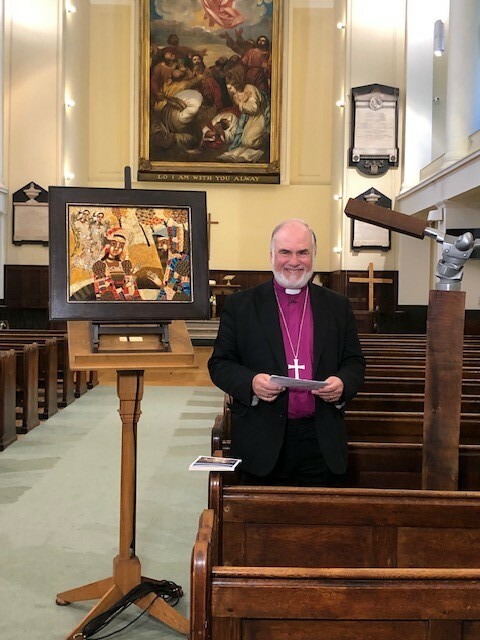 In his talk Graham referred to the scupture that he brought along (left) of Christ on the cross. 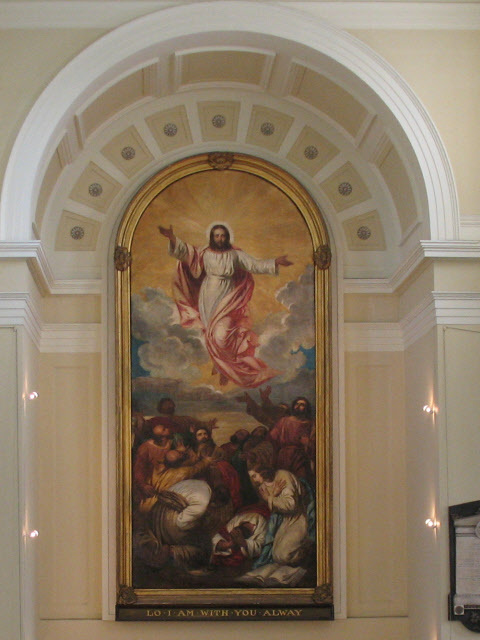 It depicts the 'eighth hour' - that is, the hour before Jesus died. Graham spoke of the suffering of Christ, taking all the sin and suffering of the world on to himself, bringing forgiveness and new life. 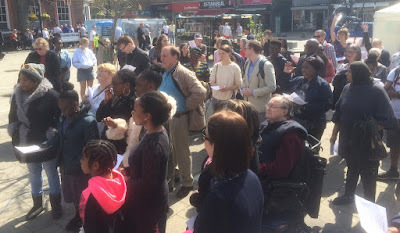 It was a memorable occasion and probably our best attended Good Friday service ever. Maundy Thursday and evening and a record turn out from St SAnne's, St James, & St Mary Magdalen gathered at St Anne's Hall for our annual Lord's Supper event. It was on the night before he died that Jesus met with the disciples for the Last Supper. 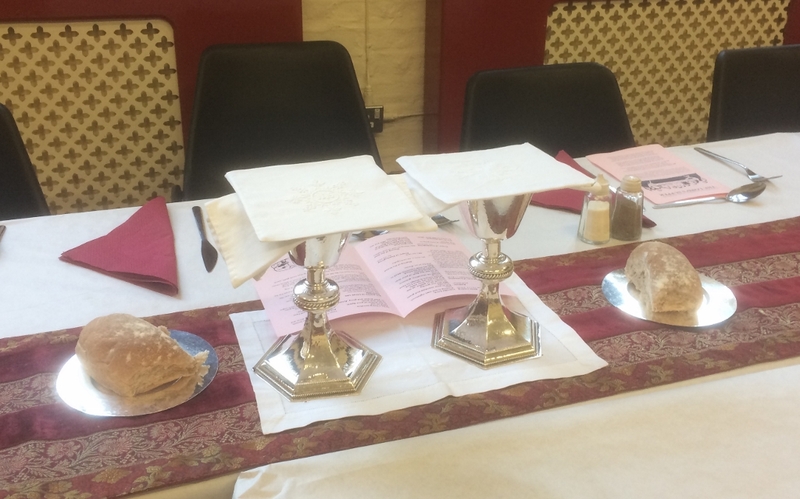 We followed a similar pattern with an opening hymn, a reading from John 13 on the washing of the disciples feet, followed by a sermon from Jacob, and a Prayer of Thanksgiving for the Bread by Sir Simon Hughes, before we shared in the bread in remembrance of our saviour, Christ. 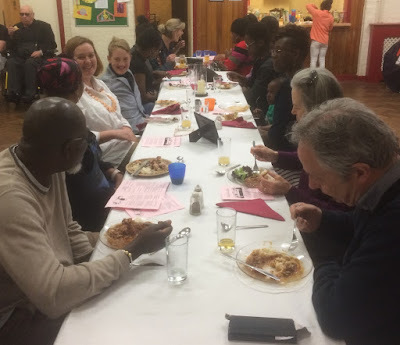 After the meal Sam Adofo, Director of the Salmon Youth Centre, led a Prayer of Thankgiving for the Wine, we shared the wine together, and then, like the participants at the first Last Supper, we sang a hymn and departed. It was a great evening of fellowship, of sharing, of remembering, of wondering and rejoicing at the amazing foot-washing-death-substituting love of God, all proclaimed to us in bread and wine: ''For whenever you eat this bread and drink this cup, you proclaim the Lord's death until he comes." The whole world has been moved by the scenes in Paris of the Cathedral of Notre Dame engulfed in flames. 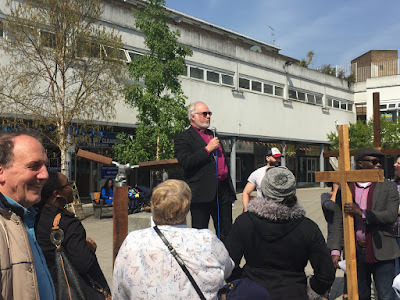 It won't have escaped the notice of Christian people that this tragic event has occurred in Holy Week, the very time when the church considfers the suffering and death of Christ, and moves on on Easter Day to celebrate his triumpant resurrection from the dead. For 850 years the Cathedral of Notre Dame has stood as a silent testimony to these events that changed the world, and secured salvation for all who put their trust in Christ. 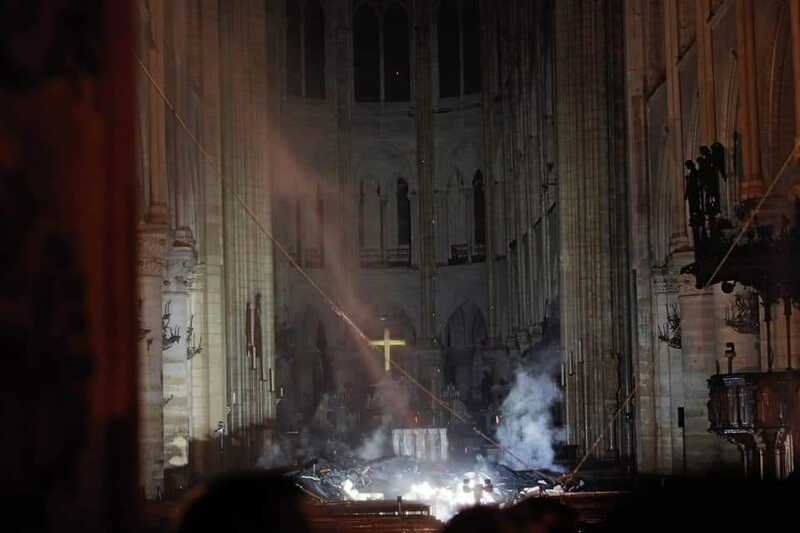 One of the most powerful images that have emerged this week is this one (above) where the cross shines in the midst of the surrounding devastation in this ancient cathedral. Here are the palm crosses ready for distribution to the congregation after today's Palm Sunday service at St James. 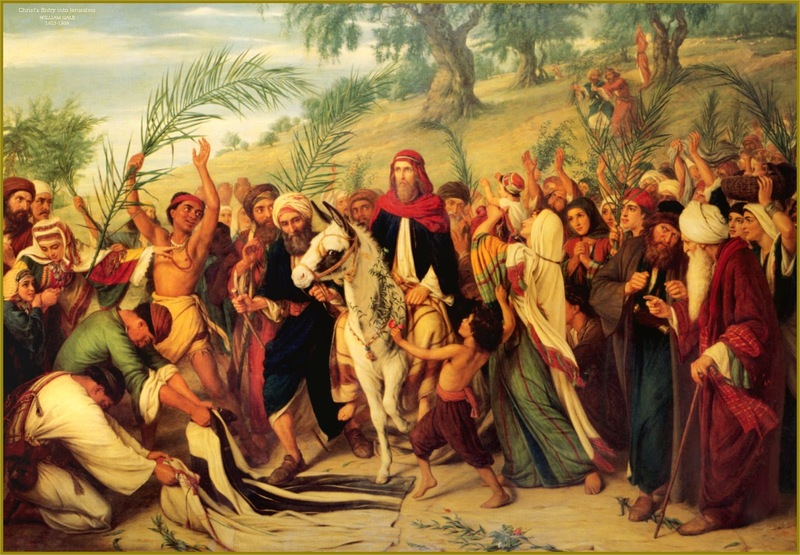 Intriguingly there's no mention of palm branches being waved in Luke's account of the triumphal entry into Jerusalem which was the one we were focussing on today. The Pharisees hate that bit - the cries of praise. 'Command your disciples to be quiet' they tell Jesus, as if it were possible to tell Jesus what to do. Ride on, ride in in majesty! Congratulations to Jude (daughter of former vicar, Stewart Hartley, and his wife, Rosemary) on her recent marriage to Alex (left). Every blessing to the happy couple in their new life together. 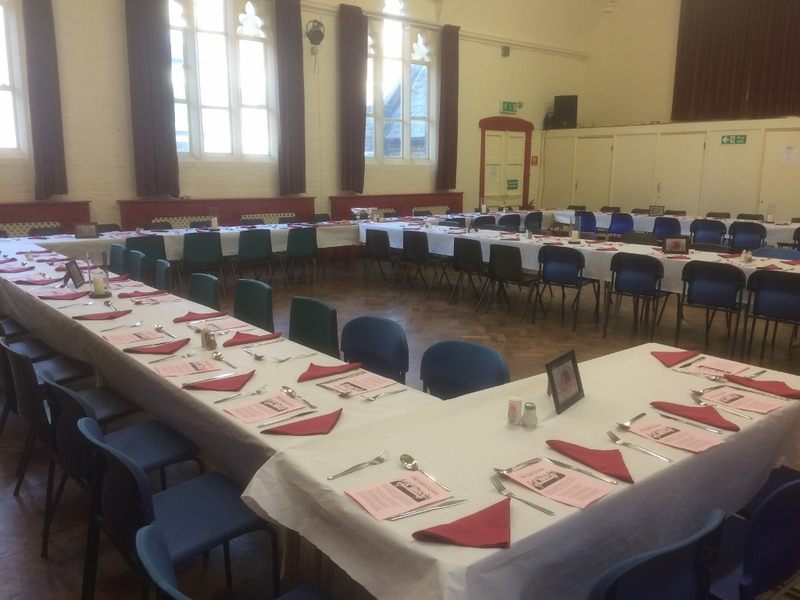 Jonathan Macy was the speaker at today's Men's Breakfast at St James. Jonathan is vicar of the Church of the Cross in the Thamesmead Team Ministry in south-east London, serving in one of the biggest parishes in the diocese, with a population of over 50,000 people, serving the Thamesmead estate, built from the mid 1960s on marshland on the south bank of the Thames, north east of Woolwich. 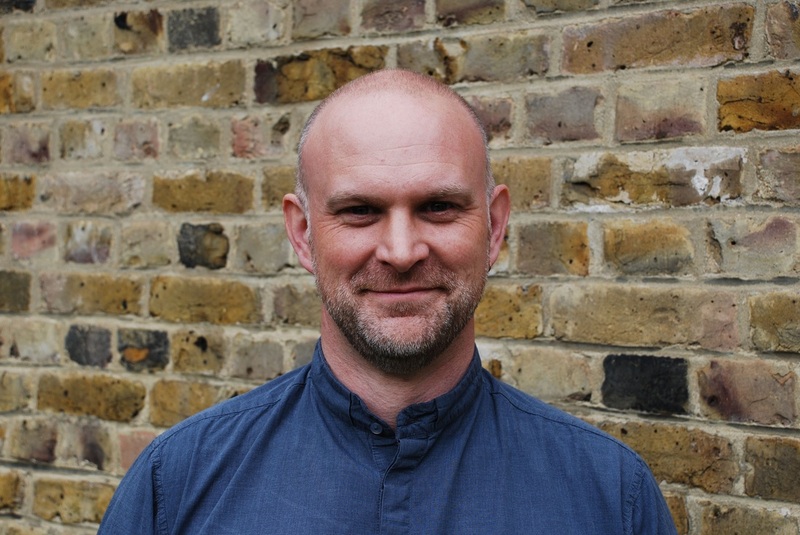 Jonathan grew up in an atheistic family but through the persistent loving witness of some mates he became a Christian at the age of 20. 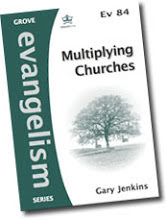 Almost immediately he sensed he was being called by God into full time Christian ministry, but there was a big problem. All his life he had lived with a severe stammer. As a twenty year old there were occasions where he could hardly talk at all, so how could it be possible for him to take on a job that involved speaking to individuals, to groups and to whole congregations? He was about to embark upon a long journey. He began work as a cleaner in a care home. 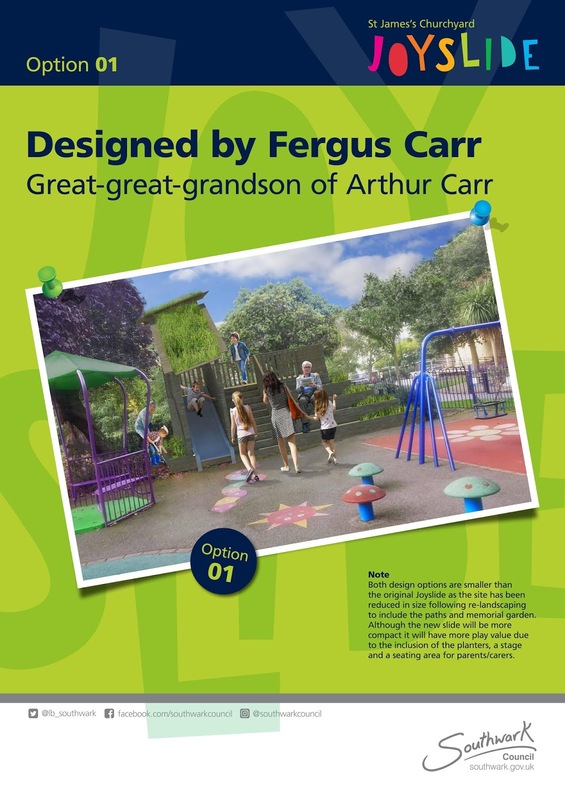 He ended up as the manager of fifteen care homes. He married and had two children, and he was selected for ordination, trained for the ministry, served as a curate in Plumstead and took on the job 'no one else wanted' in Thamesmead - but Thamesmead has been a blessing to him and he has been a blessing to them. It was God who called him and then God enabled him to do the thing that seemed at one point almost impossible - to speak in public - about the good news of God's love. 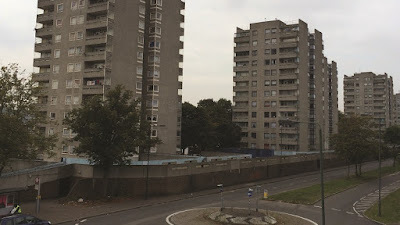 And if people in Thamesmead had all kinds of struggles in their own lives, and sometimes wondered if God could use them in their weakness, they had a pastor who (1) knew what that was like; and (2) could testify how God had used (and equipped) him. Wonderful. 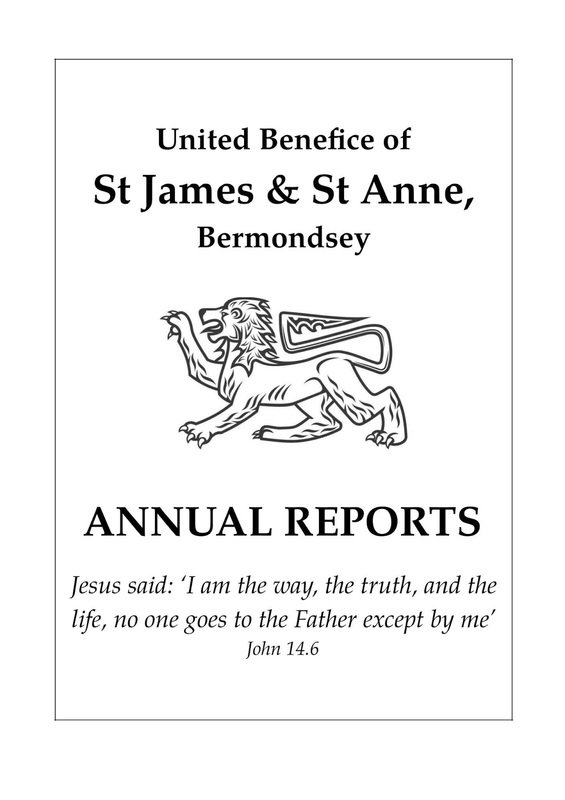 Hot on the heels of the OfSted inspection, St James's School has just received its SIAMS report, which is the report of the Statutory Inspection of Anglican and Methodist Schools which took place three weeks ago and which looked at the Christian character of the school, its religious education, and its daily acts of collective worship. 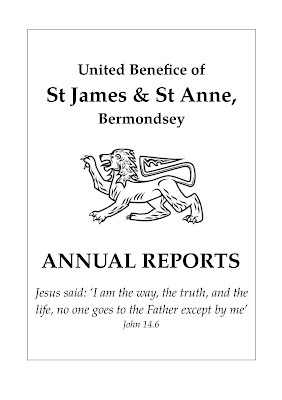 "I am enclosing a copy of the report for the SIAMS inspection of St James’s School which looked at how effective is the school’s distinctive Christian vision, established and promoted by leadership at all levels, in enabling pupils and adults to flourish, and paid particular attention to the impact of collective worship and the effectiveness of religious education. Following on from the recent successful OfSted inspection, this report from the SIAMS inspector is a further tribute to the hard work of our senior leadership team, governors and teaching staff. 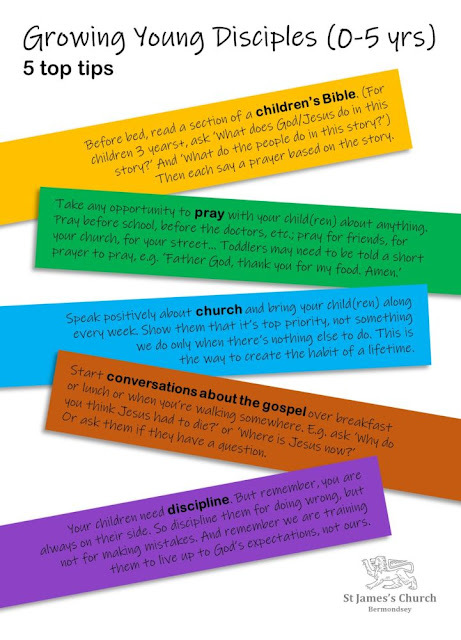 As a Church of England Primary School the Christian vision of the school guides us in all we do and governors and staff will continue to strive to offer the very best education for our children, undergirded by the teaching and values of the Christian faith." 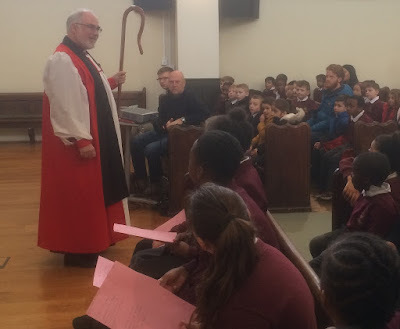 Bishop Graham joined us for our St James School end of term service this morning. 'We've got a shepherd here today' said one of the children when they say Bishop Graham's shepherd's crook - and they were right because a bishop is a kind of shepherd. Graham spoke about the crucifixion, and how Jesus died instead of us, taking our sin on himself. 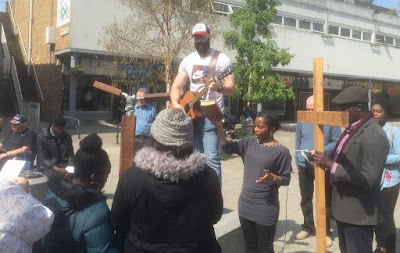 After his talk the children got to ask him questions about the cross and there was some great questions, as well as some great child-friendly answers. 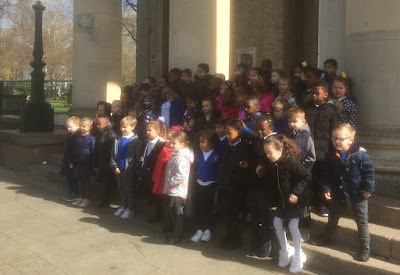 The prayers and the readings were all led by the Junior Faith Group and we sang 'Hosanna, hosanna', 'Lord of the dance,' 'I'm special because God loved me for he gave the best thing that he had to save me,' and, in anticipation of Easter Day, we concluded with 'Celebrate, Jesus is alive' with the whole school clapping along and joining in with the actions. Just before the service ended we said goodbye to two teachers who are leaving and we heard details of this year's Easter Egg Competition. 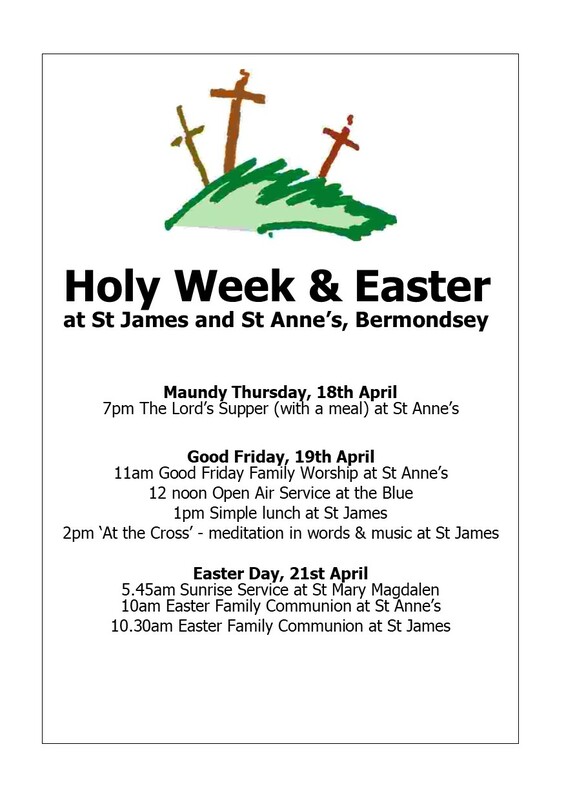 Term re-starts with a service in church on 23rd Easter. Have a great Easter break every one. 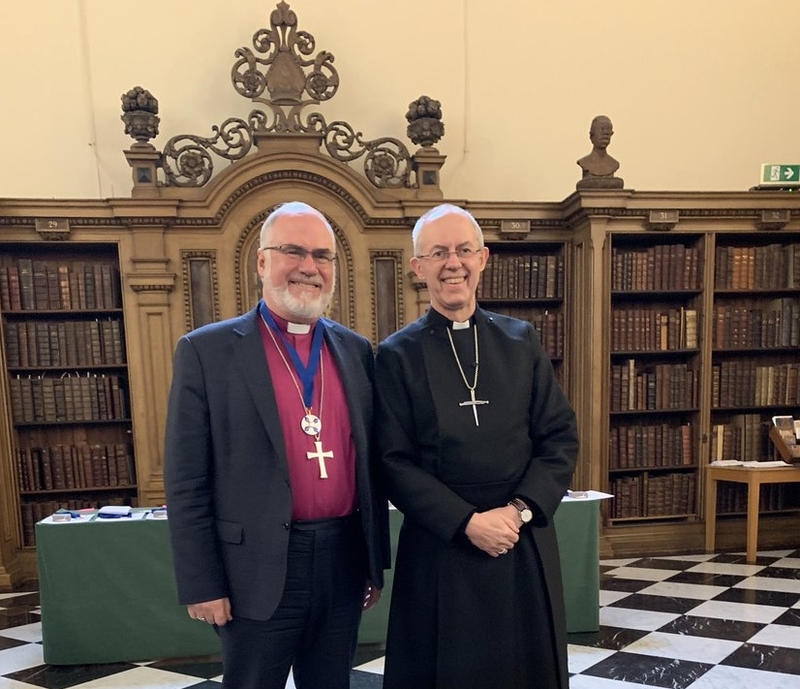 Graham is now serving as Adviser on World Mission in our diocese, alongside other duties, including involvement at London South Bank University. 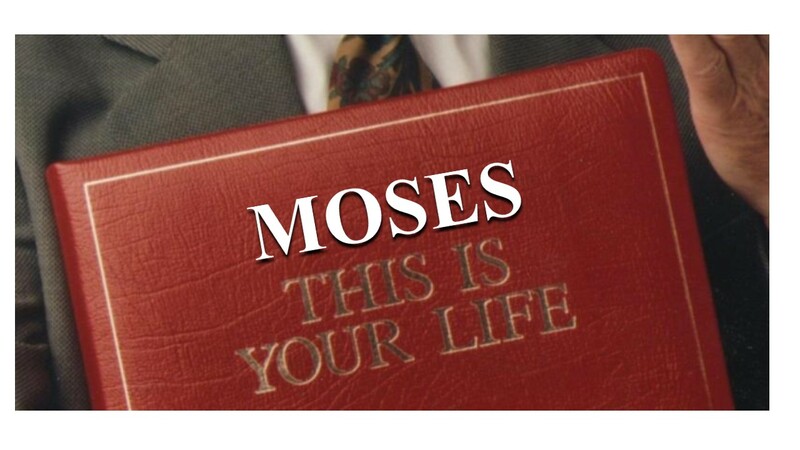 Our Wednesday night course on the life of Moses came to a conclusion tonight as Jacob spoke on the Song of Moses from Exodus 15. We saw why they wanted to sing (v1-6); what he saved them from (v7-12); and what he had saved them for (v13-18). The Lord is my strong defender; he is the one who has saved me. 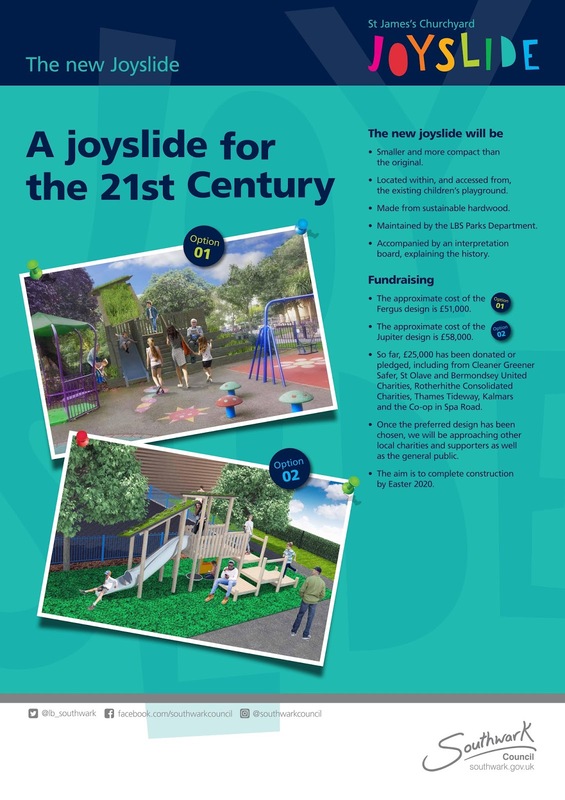 Southwark Council, the Friends of St James's Churchyard, and St James Church are working to install a re-imagined version of the Joy Slide which existed in the churchyard from 1921 to the mid 1980s. 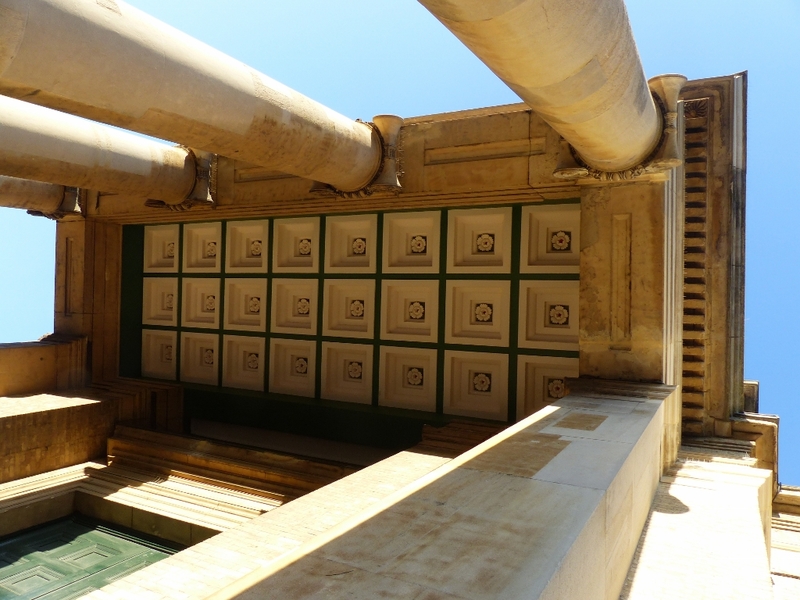 One of the parts of the church that was in really bad repair was the portico ceiling. 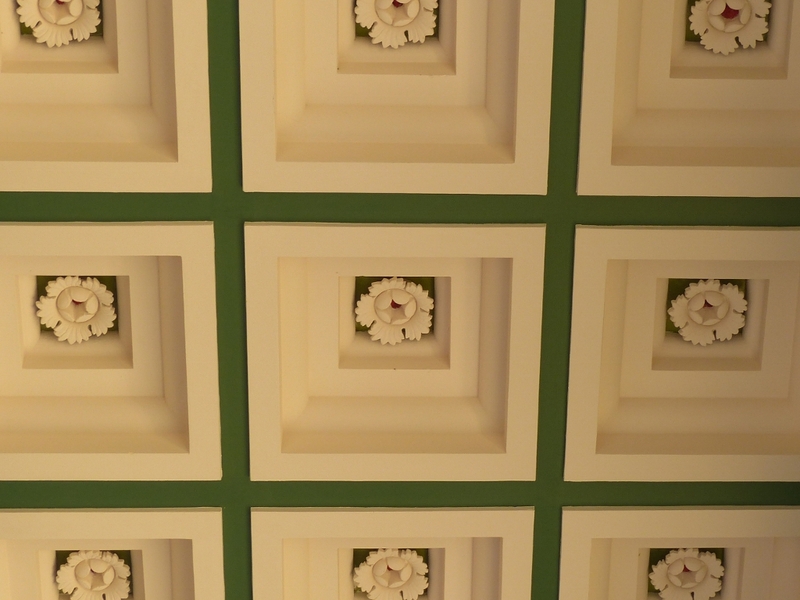 but now, repainted and repaired, this looks resplendent. 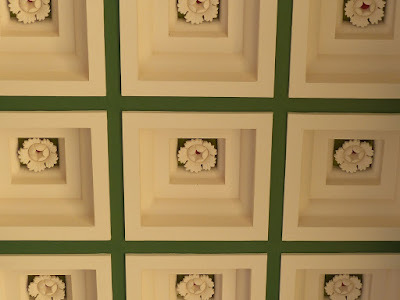 You just need to look up as you enter the building to get the full beauty of the restored decoration. Our Annual Report has just been published. The two year one classes from Southwark Park Primary School came on a visit to St James's today. They started off in the churchyard, looking up at the dragon, and listening to the clock strike ten. Then we went up in the gallery to see the whole of the church laid out before us. 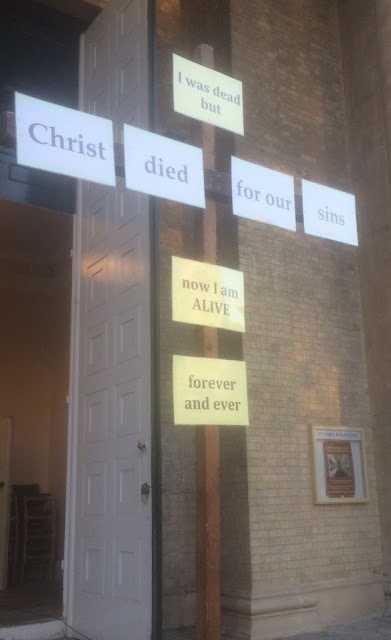 They had a look at the organ, the big picture of Jesus ascending, and the cross on the east wall (that was there, several of the children told me, because Jesus died on the cross). Another child pointed out the men on the ground of the Ascension picture and told us they were disciples. 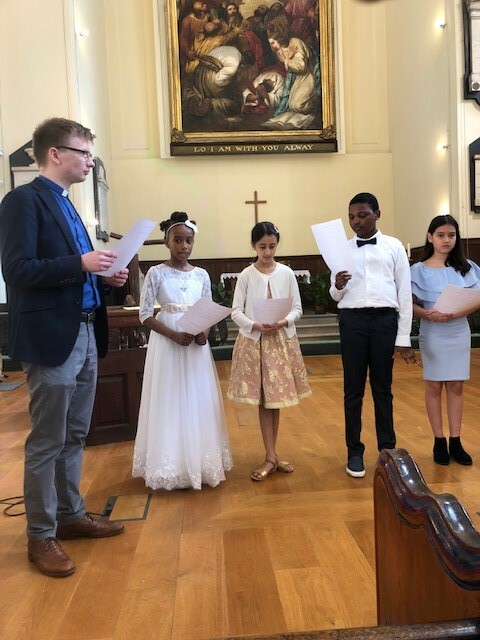 Back downstairs we gathered around the font to find out about baptism, and I showed the children what happens when someone is baptised with the help of a couple of volunteers. 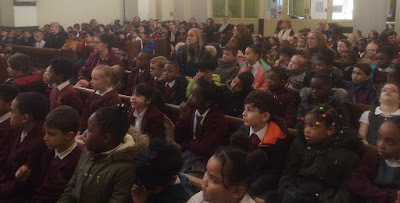 They were full of enthusiasm, bursting with questions, and very well-behaved. 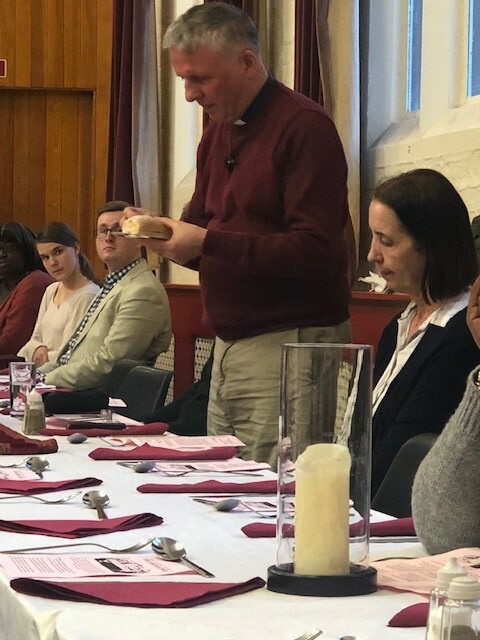 Our two church councils met for a morning yesterday to trhink together about 'GROWING WIDER' - taking the message of the Gospel out to the people of our united benefice here in Bermondsey. After breakfast together and a bible study on Acts 14. 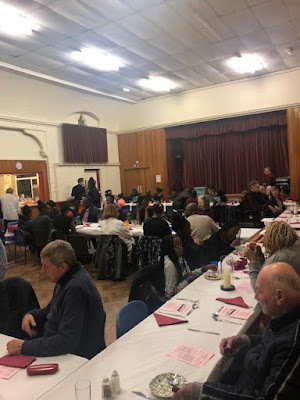 21-28 we considered the scale of the challenge - taking the Gospel to the 18,000 residents of our two parishes - before considering two new projects - Fresh Expressions of church - to reach out beyond our precent buildings and activties. 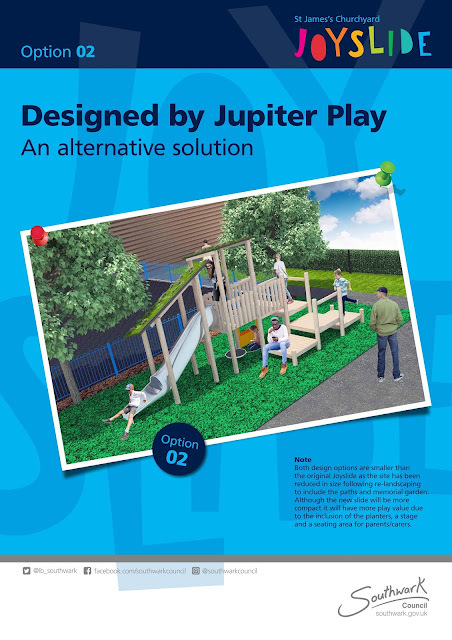 More about these in due course. That seemed just right for us. We have a huge harvest field. The labourers are few and so we need to pray for more - and that's why we ended this fruitful and encouraging morning on a note of heartfelt prayer. 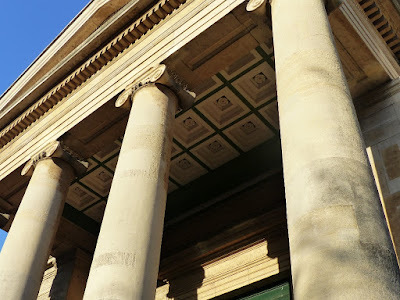 The Merry Opera Company have recently been hiring St Anne's Hall as a rehearsal place. Last night we went to see their wonderful performance of Gilbert and Sullivan's The Pirates of Penzance staged in the splendid setting of the Cutty Sark.